The game will take place on the 15th and 16th June 2019 at University of Glasgow, Kelvin Gallery, using the award-winning Black ‘Powder rules. 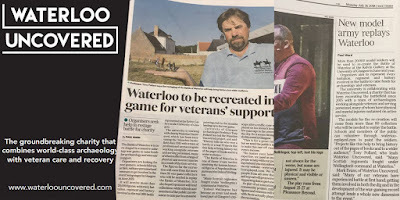 The Great Game is running in support of the Waterloo Uncovered charity that Warlord Games has been pleased to help since the Waterloo bicentenary. This is a one-off event in June 2019, which will set a world record for the largest ever historical wargame in 28mm (an application has been made to Guinness World Records to make this official). The battle to be replayed in the game will be Waterloo. You can participate, you can watch and you can sponsor. 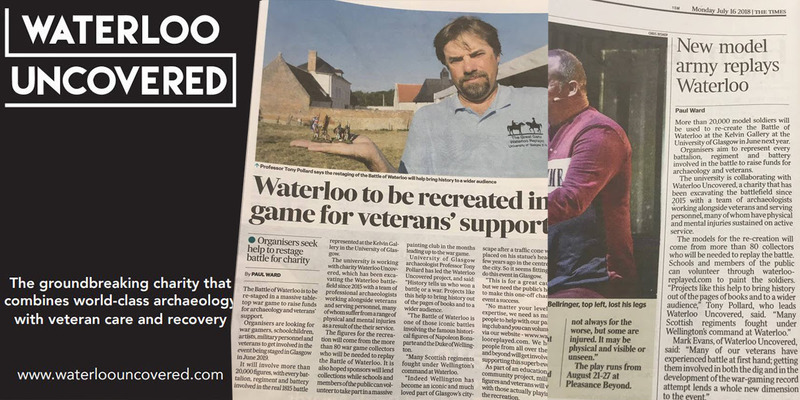 The wargame is being staged in support of Waterloo Uncovered, a charity that combines a world-class archaeology project on the battlefield of Waterloo with a support programme for veterans and the military community. Working in partnership with some of Europe’s top universities, and through the unique perspective of a team comprised of archaeologists, veterans, and serving soldiers, Waterloo Uncovered aims to understand war and its impact on people — and to educate the public about it. Professor Tony Pollard, Professor of Conflict History and Archaeology at the University of Glasgow is an archaeological director of Waterloo Uncovered and the lead academic on the project. It is his initiative to stage ‘The Great Game: Waterloo Replayed’ at the University of Glasgow, but this is very much a team effort and information on those playing key roles in the organisation of this unique event can be found elsewhere on this website. The event will be a replay of the Battle of Waterloo, fought on 18 June 1815. It will be held at the University of Glasgow over the weekend of 15 and 16 June, 2019, in the Kelvin Gallery (shown above). This is an impressive Victorian galleried hall in the Gilbert Scott Building, the striking main building of the University which sits on the summit of Gilmorehill. The scale is 28mm, and the rules to be used are Black Powder, produced by Warlord Games. Set-up will be on Friday 14 June, and the game will commence on the morning of Saturday 15 June and continue through Sunday 16 June. The outcome is unknown. This is a game after all! There will be a social event on the evening of Saturday 15 June. Uniquely, this will not merely be a game played by wargamers, but it will also involve Serving Personnel and Veterans (SPVs) who will be attached to experienced wargamers for the game. This is in line with the philosophy of Waterloo Uncovered, the charity which this event will support. In addition, school children and members of the public will also be able to get involved with playing the game and associated events leading up to the event. Every battalion, regiment and battery will be represented. In total well over 20,000 figures will be fielded on a unique table on the ground floor of the Kelvin Gallery. A series of other wargames, illustrating the military history of Britain, will be staged in the extensive balcony area that projects from all four walls of the hall. This balcony will also allow a unique overview of the huge battle in progress below. The wargame is being staged in support of Waterloo Uncovered a charity that combines a world-class archaeology project on the battlefield of Waterloo with a support programme for veterans and the military community.